If you are looking for the best Husky puppy shampoo, you have come to the right place. After a careful examination of what the market has to offer, Dr. Fox has come to the conclusion that the Burt’s Bees All-Natural is the one you should consider. This option is made with only nature’s finest ingredients and an excellent choice if you want a quality natural puppy shampoo. The unit is pH-balanced so that the formula does not harm the sensitive skin of your pup. What’s more, the buttermilk soothes and softens the skin while the linseed oil will condition the coat and skin. If our first pick is not available for sale, we recommend you bear the Oster Oatmeal Naturals in mind. This option is both a shampoo and a conditioner all into one, so you get all of the benefits of each in just one bottle. The natural ingredients in this alternative make for a gentle cleaning with no artificial substances like preservatives, or colors that might affect your dog’s coat and skin. The buttermilk added to the formula is a great addition, too, as it is capable of soothing itchy skin. Some buyers argue that this shampoo does not remove the ‘dirty dog’ smell. 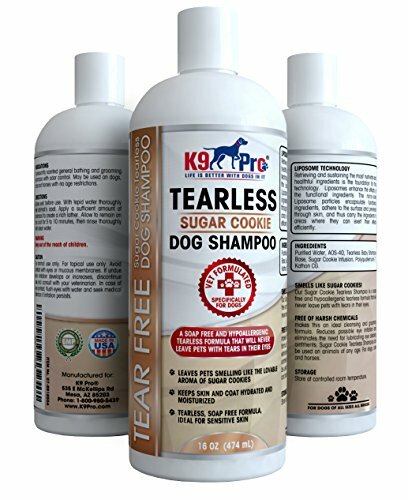 This tear-free shampoo is made with natural ingredients and is safe to use on puppies and adults alike. If your Husky is experiencing problems like itchiness or dry skin, this Oster option might be the right one to consider. It is made with 100% natural oatmeal, so it is capable of leaving your pup’s coat clean, but in a gentle manner. It doesn’t contain any alcohol, phthalates, parabens, or any other such harmful artificial ingredients. It is also pH-balanced and safe to use. The fragrance does not last for more than a day, which might bother some buyers. This oatmeal shampoo offers great results if your Husky puppy is experiencing various dermatological issues such as hotspots. Cleaning your puppy’s sensitive skin has never been easier because this shampoo will allow you to do just that and you won’t have to worry about anything. It doesn’t irritate the animal’s skin nor does it cause any tears while you’re bathing him or her. It works both with puppies and with adult dogs, so you don’t have to get a different shampoo later on. It promotes detangling, too. Since it is rather viscous, you have to dispense it in a dish to make the process easier. 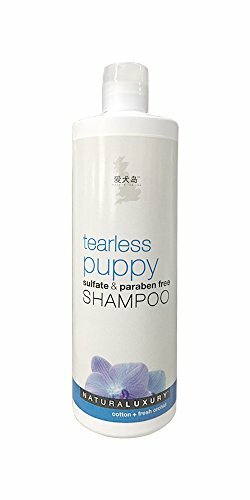 This tearless shampoo is gentle and delicate and even smells nice, too, since it has a cotton and orchid scent that you’ll appreciate. To make things even more accessible to you, we have gone and read some of the popular Husky puppy shampoos reviews and considered the quality and value offered by the products in this line to draw a short list of critically acclaimed products just for you. If you want to find the best puppy shampoos for Huskies quickly, the following list will be able to help. The 2-in-1 formula of this model will ensure that you get two products for the price of one. Aside from the high-quality puppy shampoo, you also get the benefits of a conditioner that will soothe and soften the coat of your Husky for a look that will have everyone turn their heads to admire your beautiful pup. The natural ingredients will ensure that your pet will experience a gentle cleaning with no sulfates or colorants that could harm his or her sensitive skin. The shampoo is also pH-balanced so that it can take care of the special needs that the skin of a Husky requires. As a plus, if your pet has especially sensitive skin, the addition of buttermilk will help soothe and soften it. Since you won’t have to worry about dangerous chemicals being used, this unit offers a tearless experience so that your dog’s eyes no longer have to suffer when the bath time arrives. Does your pup suffer from dry skin that makes him or her prone to infections and irritations? 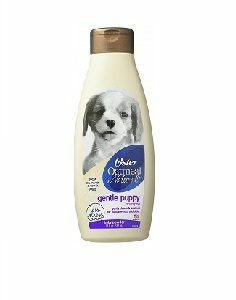 The Oster Oatmeal Natural is a great puppy shampoo for dry skin that will moisturize and soothe your dog’s skin and coat with the help of natural wheat protein, gentle humectants, and rosemary extract. It also contains 100% natural oatmeal, a wholesome ingredient recommended by veterinarians due to its proven qualities of soothing and protecting the skin. Because the formula is made with more cleaning ingredients, it will also help lift more dirt from your pup’s coat in a gentle manner, leaving it clean and fresh. It is pH-balanced, and it does not contain parabens, phthalates, alcohol or dyes, which means that it is very gentle, a feature that your puppies’ extra sensitive skin is going to love. The long-lasting baby powder scent will keep your pet smelling fresh without leaving harmful perfumes that could be ingested while liking his or her fur. If you’re in the market for an affordable but highly efficient purchase, the Isle of Dogs Tearless is a choice that we believe can be the answer to your needs. 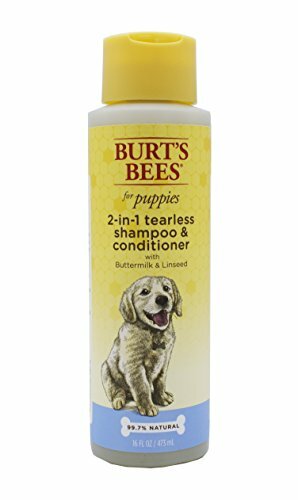 The shampoo is sulfate and paraben-free, and it is designed to work wonders on your puppy’s sensitive skin by keeping it clean and fresh without harming or making the Husky feel uncomfortable. This model features the brand’s signature scent, the cotton and fresh orchid that will leave your pet smelling great for days. What’s more, the tearless formula will make bathing time much more comfortable to handle since it will not irritate the eyes. Because this is a product made to cater to the need of dogs of any age, you won’t have to switch shampoos once the pup grows older. Customers also love the fact that the formula helped with brushing, so that you no longer have to use your trusty vacuum for dog hair on a daily basis to get rid of the nasty hairs. 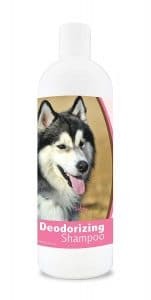 Keep your Siberian Husky fresh and clean with the effective Healthy Breeds formula that features a delicious Sweet Pea Vanilla scent that will get rid of the unpleasant wet dog smell. It is pH-balanced in order to keep the vibrant color, shine, and health of the coat without irritating or damaging the sensitive skin of your puppy. 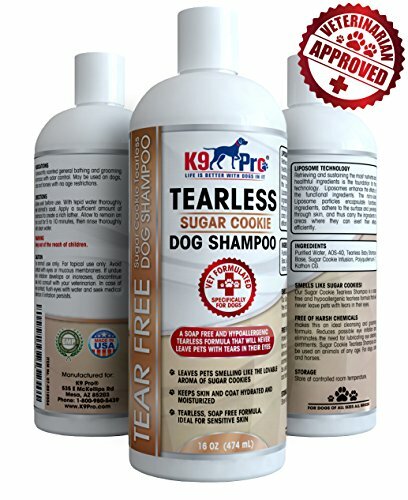 The shampoo also contains essential fatty acids that will nourish and aid in the scaling and flaking of the skin, while the natural moisturizing factors will promote the hydration of your dog’s skin and coat. Another nifty feature of this model is that the hypoallergenic formula is safe to use together with any of your favorite flea treatments for puppies. Since the unit comes with a deodorizing feature, it will help remove bad odors at a molecular level so that you don’t need to worry that the shampoo will merely mask the bad smells for a short period. The tear-free and soap-free formulation of the K9 Pro alternative will make every bathing a pleasure for both yourself and the Husky. You can say goodbye to other cheap options that use soaps with harsh chemicals and detergents that can be harmful to your pet. 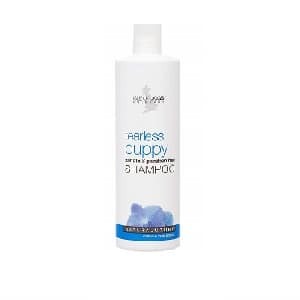 The formula used for this shampoo uses all natural and hypoallergenic ingredients. 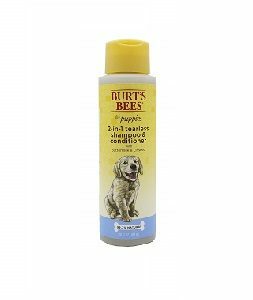 Itchy, dry, and sensitive skin can be a real problem for puppies, which is why the ingredients present in this bottle will help moisturize and soothe the skin. All the active ingredients will penetrate the skin more efficiently with the help of the proprietary pharmasome technology, meaning that you will get to notice the benefits of this shampoo after the very first use. Customers were impressed with the quality of this option, praising not only the effectiveness of cleaning their pet and maintaining the skin and hair well-moisturized but also the unique and pleasant smell that it leaves on your Husky’s coat. Finding a good Husky puppy shampoo can turn out to become a real adventure if you are not sure what type of product to get and on what features to focus your attention on. Learning all this information requires a bit of research on your part, but this can be a tedious and time-consuming process that not everyone can afford to undertake. This is why we have taken the time to research the market for you. We have compiled the following buyer’s guide by taking into account the numerous consumer reports, surveys, and other specialized resources. Take a look below if you want to know what are the key points you need to focus on when purchasing this kind of product. While there are many shampoo manufacturers nowadays that create products that are advertised as safe for both fully grown Huskies and puppies, we still believe that if you are a new pet owner, it is best to get a specialized puppy shampoo. Puppies have specific requirements, and if you don’t get a formula designed for them, you risk damaging their skin or coat. The products designed for puppies are gentler on the skin and coat since just as a baby human has sensitive skin and requires specialized care products to ensure no harm comes to him or her, the same is true for a puppy Husky. Thus, getting a product that is designed for puppies is a good way of avoiding any potential problem down the road. We also recommend that you go with an option that features tearless ingredients, so that bath time does not become unpleasant for both yourself and the dog. A tearless shampoo will also help your puppy get used with the grooming routine much faster. As we mentioned above, the skin and coat of your pup are very sensitive, and the best way to provide him or her with a pleasant bathing experience is to try and stay organic. Unless your Husky is suffering from skin irritations or other ailments, where a medicated shampoo was recommended by the vet, going with a natural option is what owners and specialists alike recommend. The organic options feature ingredients that are far less likely to cause allergies or skin problems. You should avoid options that feature artificial colors, perfumes, parabens, alcohol, or sodium laureth sulfate. These ingredients are extremely common in pet grooming products and are known for causing problems, especially to sensitive pups. We, humans, like to smell good, but you need to bear in mind that dogs have not evolved to smell as pleasant as we do. They like to explore their world by sniffing, so choosing a product that has an overbearing scent will not only make them uncomfortable, but it will also affect the way they interact with the world. As such, when choosing a scented product for your puppy, it is imperative to pick one that is not too strong. You should certainly avoid options that use artificial perfumes and focus instead on choices that leave a subtle and natural scent.